Amboseli are the plains below Mt Kilimanjaro. The waters from melted snow drain down the mountain under lava flows and surface in Amboseli creating a green belt of swampland amidst dusty plains. Here, hippos, elephants and bird life can be seen against the backdrop of the magnificent snow-capped mountain. 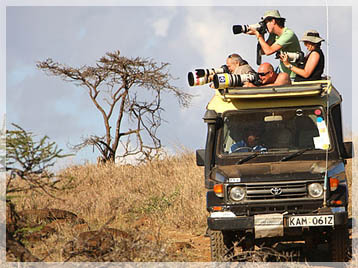 Also the game parks of Northern Tanzania are amongst the best in the world and offer some unique game viewing. Ngorongoro Crater is renowned for its packs of Hunting Dogs and a wide range of other game. Lake Manyara lions have developed a liking for residing in the branches of trees where they can both sleep and watch for prey while Serengeti is where the wildebeest’s migration starts. After breakfast leave the camp/lodge for the last game drive as you leave the park for Namanga border post for immigration formalities and arrive in Arusha to drive to Lake Manyara National Park for lunch at Lake Manyara camp, followed by afternoon game drive. Dinner and overnight at Lake Manyara campsite. After early breakfast, drive to Ngorongoro Crater arriving in time for lunch. Afrer lunch, descend 2000 ft (670m) into the crater floor for full day crater tour with break for lunch at Ngoitoktok springs picnic site. Black manned lions, rhinos, buffaloes, elephants and other grazing animals abound. Evening game drive, return to Ngorongoro wildlife campsite for dinner and overnight. After breakfast, leave Ngorongoro Crateri for Tarangire National park with lunch enroute, the park has an atmosphere of remoteness and has a good number of monkeys, hornbills, pelicans, and herons among others. Dinner and overnight at the campsite. After breakfast early morning game drive followed by lunch at the campsite /lodge, then proceed to Arusha for dinner and overnight in a hotel of your choice at extra cost.